Growing up in Hong Kong, basketball was one of my favorite sports (the other is PingPong). I played in my high school team and pick up games with male and female classmates. Years later in the United States, I was still playing pick up games during lunch hours in my company's parking lot. As a mother and a software development manager, I earned the nickname "Downtown Winnis" being the only female in an all-male court. Why downtown? With assists by my six-foot-seven tall teammate, I could shoot from the outside. I loved playing basketball with our son, even after he grew taller than me. When he was ten, our family went on our first mission trip, with a team of mostly high schoolers, to an Indian Reservation. At the end, when team members wrote appreciation notes for one another, I received a note that read, "Auntie Winnis, I appreciate you playing basketball with us under the hot sun!" I haven't played much basketball after our son left home for college. 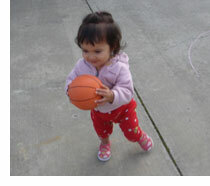 Imagine how excited I was a few years ago when I saw our granddaughter playing with a pint-size basketball. She was not even 18 months old (still wearing diapers) but she looked like she could handle the ball. Isn't that amazing? In his book, 7 Kinds of Smarts -- Identifying and Developing Your Many Intelligences, Thomas Armstrong wrote, "By definition intelligence is the ability to respond successfully to new situations and the capacity to learn from one's past experiences." He then described intelligence in word, picture, music, body, logic, people, and self. Every child is unique and wants to feel competent and accepted. It is important for parents and teachers to expose children to many different areas of intelligence and to help them discover their strengths. Success breeds successes. Focusing too much attention on meeting your expectation (e.g. academic achievement) at the expense of their natural gifts and talents would only hurt the learning potential of blossoming children. Children can learn a lot while they are playing. I encourage both parents to play various games with your child individually and together. Armstrong lists resources and games that aid the development of different types of intelligence. Children often learn best when they are having fun. What a joy it is to help kids to think, feel and relate better by playing with them! I preferred reading stories and playing lego, Connect-Four, basketball, ping-pong, and music with our son; but James most often swam and played Risk, Battleship, Chess, Chinese Chess, and other strategy games with him. Together, we played board games (e.g. Sorry and Monopoly). Indeed, one of the best ways to build a relationship with a child is through play. By the grace of God, I turned away from being a workaholic when our son was five and started to enjoy playing. Earlier this year, he took me to a ball game. Guess which team! This feature article, Playing to Your Strengths, has suggestions of one way to enjoy work and life, even parenting. Mother and son time is always precious and very rewarding. In March, our son's family of four flew to Houston with James and me to attend my niece's wedding. Before our trip, he contacted Jeremy's mom. 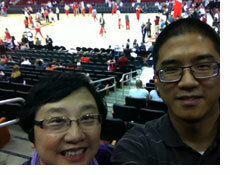 Thanks to Auntie Shirley, he took me to the ball game to watch Houston Rocket. We arrived early at the Toyota Center and walked leisurely in the city park across the street, eating our packed dinner (leftover Dimsum from lunch) on a bench. Before the game, we stood up from our courtside seats and took this selfie! Everyone has strengths and weaknesses. Parenting is having two people working as a team to raise a child - your common project. Today we will look at how playing into our strengths may get better results in work, life, and parenting then focusing on our weaknesses. How often have you invested in training to try to improve something you felt you were not good at? If your background is in engineering, perhaps it was marketing, sales, personnel management or public speaking. For most of us, trying to improve our weak areas in operating our business or managing our department or parenting comes with the territory. Whatever the area, we feel as if we are required to do battle with what we don't do well. As it turns out, the majority of people around the world feel this way. In their book Now, Discover Your Strengths, authors Marcus Buckingham and Donald Clifton say that across all ages and cultures, people are more concerned about their weaknesses than their strengths. In other words, most of us believe that our weaknesses matter more in holding us back than our strengths matter in advancing us. That's nonsense, say the authors -- widely held nonsense, but nonsense nonetheless. In their provocative theory, they suggest that the better strategy is to play to your strengths, building upon your core talents, and work around your weaknesses. You can work to add skills and knowledge to increase your performance in any area, but unless you are building upon one of your innate talents, your efforts won't produce exceptional results -- some results, yes, but not dramatic improvement. "Unless you have the necessary talent, your improvements will be modest," write Buckingham and Clifton. "You will be diverting most of your energy toward damage control and very little toward real development." The expression "damage control" is the authors' term for trying to minimize your weaknesses -- the areas where your lack of talent actually get in the way of your performance. Get a little better at it. In some cases, your weakness is only moderately impeding your peak performance in other areas. If so, then maybe damage control is the right solution. Parenting knowledge and skills can be learned. As long as you are willing, you can be better! Develop a support system. Whatever you need to function well, whether it is time management systems for those with a talent for adaptability but not discipline, or a scheduled walk in the park for disciplined folks who neglect self-care, you can often blunt the effects of your weaknesses through such structured inputs. The same is true with parenting. In the old days, parents could rely on extended families to care for their kids, what support system do you have now? Study your prospects. In business, if your skills tend toward the analytical and away from such talents as wooing clients or dealing directly with confrontation, then you probably ought not be spending a lot of time in sales. But when you do have to sell something -- such as one of your ideas -- approach the problem analytically. Rather than agonize over your lack of salesmanship, study your prospects, dig into what makes them tick and what ideas they've accepted in the past, and let your enthusiasm for your ideas do the talking. In the same way, you can improve parenting by studying and understanding your child. Remember, love conquers all. Your child will not care about what you say unless he or she knows that you care, so learn to talk so that they will listen, and listen so that they will talk. Find a partner. This may be the best approach for small business people and "solo" practitioners. Go into partnership discussions with a clear-eyed understanding of the strengths you bring, and the strengths you need from your partner. Don't be shy about your strengths -- the whole point of this is to create a world in which you get to do what you are really good at. And be open-minded about what a partnership looks like. In parenting, don't forget that God has given your child two parents by design. No doubt you and your spouse will have different opinions and styles. When parents appreciate one another's strengths rather than criticizing each other's weaknesses, they start working better as a team. The last option, say Buckingham and Clifton, is just don't do the things you are weak at. In a corporate setting you might get away with this, particularly if you are a high-performer in the areas of your strengths. If you're a small business owner and your organizational chart tends to have "me" written in most every box, not doing something may not seem like much of a choice. But keep it as a goal and continue to work toward the day when you can contribute to your business exclusively from the place of your highest strengths. Parenting is like having a "Ma and Pop" small business. Don't lock yourselves into specific roles. Being connected and flexible will help your family grow in challenges. 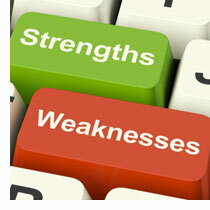 What do you think about this idea of managing around your weaknesses and playing to your strengths? Is life only about performance? Were there times that you got into trouble by over-using your strengths? How about a time that admitting your limitation, imperfection, or vulnerability actually brought blessings? "For You formed my inward parts. You covered me in my mother's womb. I will praise You, for I am fearfully and wonderfully made. Marvelous are Your works, and that my soul knows very well" (Psalm 139:13-14). How can you help your children to explore, learn and grow so that they discover who they are? Please share your opinions, stories and prayer requests.